"Well actually, you can't technically prove Santa Claus doesn't exist, so being agnostic about Santa Claus is the only tenable position to take." This is a disingenuous and intellectually lazy position. Such fence-sitters just can't be bothered to understand the evidence behind the fact that there is no Santa Claus; that it is and always was a fiction. I submit that the reason for taking such a patently absurd position is out of fear of offending people who believe in Santa Claus. "Nobody should even care whether there is a Santa Claus or not." Really? Really? The discovery that Santa Claus was actually real would not be the most astonishing, world-changing event in history? The discovery that all of reality, all of history, all of science is now proven to be upside-down, inside out, and just plain wrong? 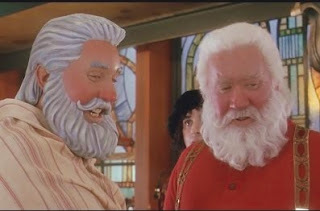 If there's even a chance that Santa Claus was a real being who did what the stories claim he does, do you honestly expect me to believe that you wouldn't want to know this? Well, I don't believe you. Santa Claus Agnosticism and Santa Claus Apathy are wholly unnecessary positions to take because it can be demonstrated beyond any reasonable person's doubt that there never was any Santa Claus apart from possibly Nicholas of Myra, a 4th century figure of questionable historicity who scarcely resembles the Santa Claus of popular mythology, and who is now widely acknowledged as being dead. So how do we know there really is no Santa Claus? 1. Provenance of source materials. There is no corroborating documentary evidence for Santa Claus apart from a small number of source documents which cannot be regarded as anything other than fictional works. They have always been recognized as fiction, and were never intended to be anything but. Also we can trace the development through history of the myth of Santa Claus, demonstrating that rather than arising from an individual's actual acts, they arose in a syncretic manner through ordinary myth-making processes. Basically, just people making up stories. 2. Demonstrated physical impossibility. The acts attributed to Santa Claus are provably not things that this universe's physics support or permit. For Santa Claus to be real, physics, biology, chemistry, and even economics would have had to turn out quite differently to how they are actually discovered to be. 3. Absence. No real Santa Claus has ever been observed, communicated with, met with, photographed, or has ever left any physical or documentary evidence not explainable by entirely mundane non-Santa circumstances. Neither would any real Santa have a legitimate reason for concealing his existence, the existence of elves, flying reindeer, gifts not actually manufactured and delivered by humans, or those three women he's always talking about (rather disparagingly, at that). Absence of evidence precisely where that evidence must be found to support a hypothesis is perfectly valid evidence of absence. If you are one of those who crouch behind a misunderstanding and misrepresentation of the Scientific Method and Karl Popper's Inductivism and squawk about being agnostic while feeling superior about it, then you, my friend, are Dumb and Wrong. Agnosticism is not a reasonable position to take when there is ample evidence against a proposition and zero evidence for it, regardless of how many people believe in some piece of demonstrable nonsense. No, you are merely afraid of ruffling feathers by offending people's cherished delusions. So don't pretend that agnosticism is a superior position to take, and that it is anything other than disingenuous intellectual laziness.